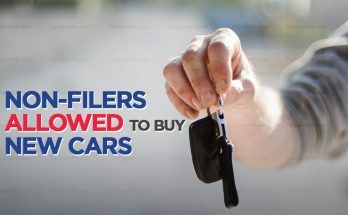 Ever since the Auto Policy 2016-21 was announced, people had a hope of witnessing competition in the automobile market. Something that should allow them to choose between two products in a given budget or segment. 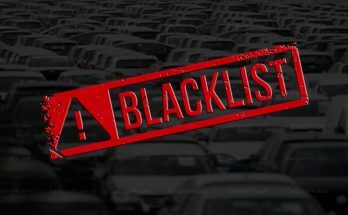 The primary objective of the auto policy was to break the monopoly of 3 Japanese players in the market, by mainly attracting non-Japanese automakers, create competition between players, shorten the delivery period, eliminate own/ premium, bring down car prices and improve the quality of products offered to the customers. However 3 years down the line, the market is yet to witness true competition as it was desired. All that has been introduced so far are either commercial pickups and minivans, or expensive options above 3 million price bracket. There is literally nothing for the mass market buyers that actually competes against the 3 dominant players. The delivery period still stand for months, there is still a huge sum of own money to be paid if one needs to get instant deliveries and the market is still starved for more mass market options. Yes, there are more than 12 automakers in process of making an entry. 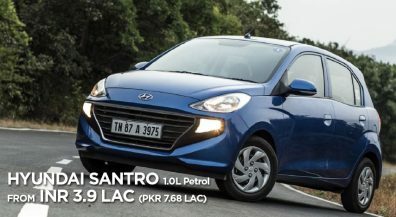 Assembly plants of Hyundai-Nishat, Kia-Lucky, Renault-Al-Futtaim and Changan-Master Motors are under construction but so far these automakers, despite attaining Greenfield status, have either introduced expensive options above 4 million price tag, or have launched commercial pickups or minivans in the market. 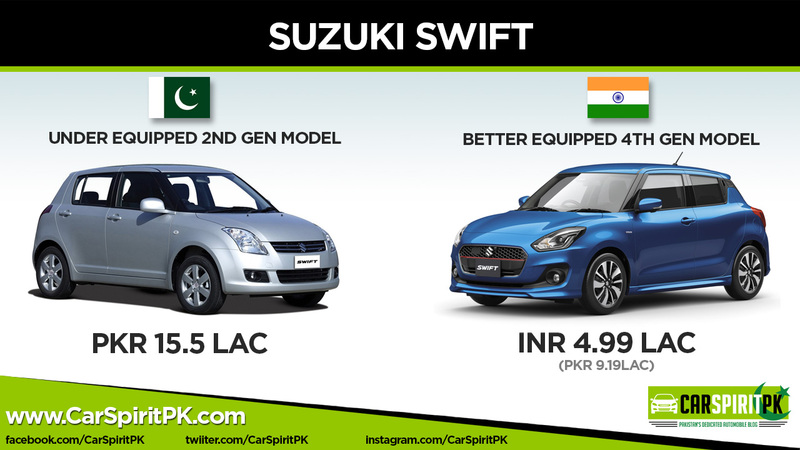 On a positive note, sensing competition the portfolio of existing automakers, especially Pak Suzuki was improved. 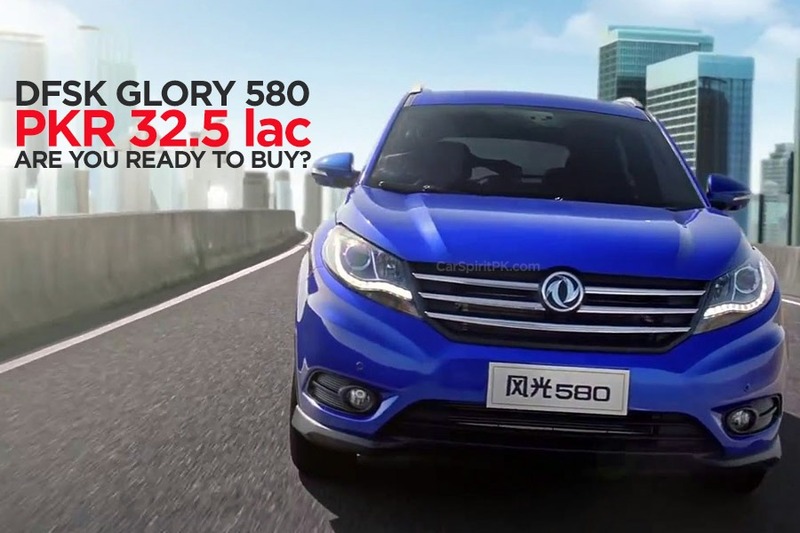 The company notorious for selling 20+ year old cars in Pakistan introduced imported Ciaz sedan, Vitara SUV and Mega Carry pickup. 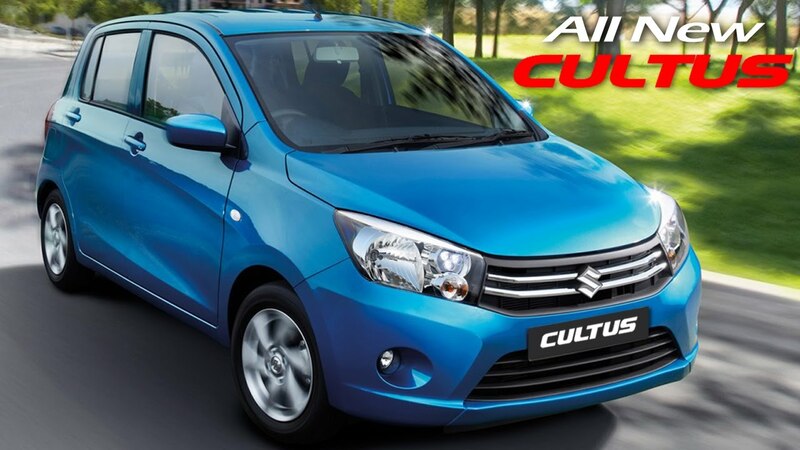 And more importantly launched the Celerio hatchback as a replacement of the MK-II Cultus, the development of which dates back to the late 80s and was on sale for more than 17 years in our country. 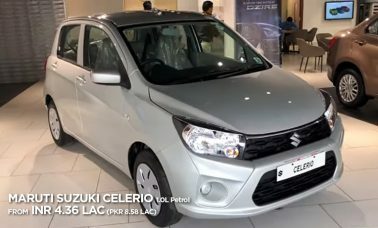 The company also announced to officially retire the 2nd generation Alto, again a car from mid 80s sold as Mehran, and announced to introduce the 8th generation Alto as a replacement, which will most likely hit the market by March 2019. 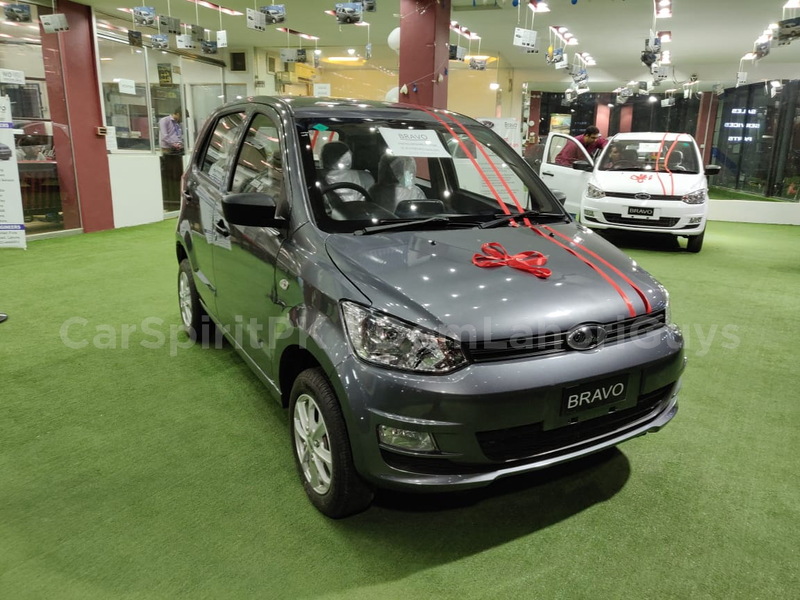 Just when Pak Suzuki officially announced to end the production of Mehran, United Motors who received the Greenfield investment status last year, launched their Bravo hatchback with a price tag of PKR 850,000. 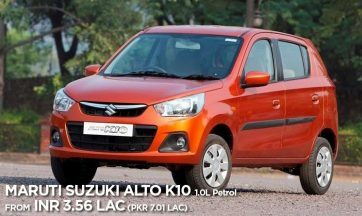 The Bravo although looks much modern than the Mehran carries the same (replica) engine that powers the hot-selling Suzuki hatchback. 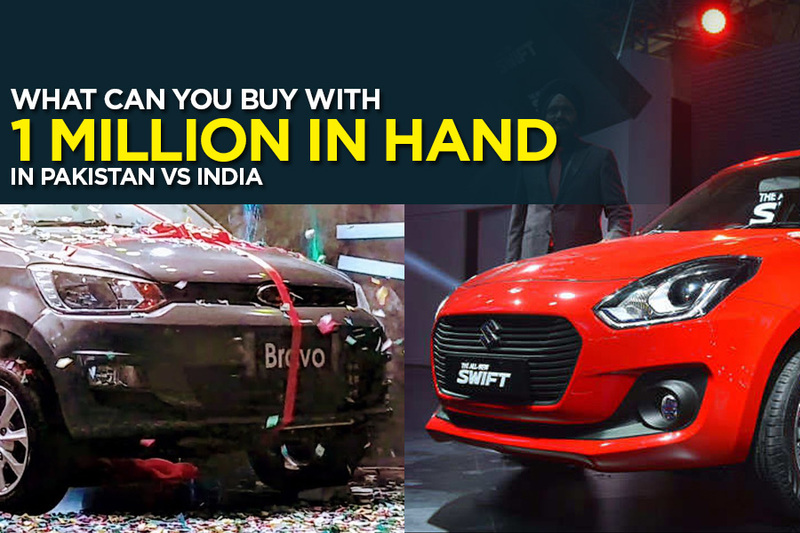 Bravo offers a lot more than what Pak Suzuki offered to us with Mehran, and remains the only option for Pakistani buyers to have something under 1 million price range. 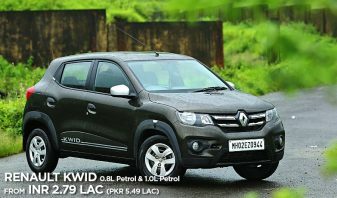 However recently its price was also revised amid depreciating Pak Rupee against US Dollar. United Bravo is now available for PKR 895,000. 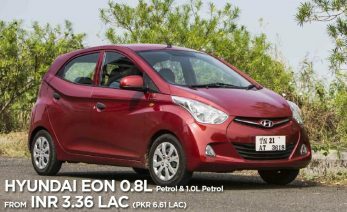 The on-road cost of this hatchback (after freight, registration, insurance) comes little close to a million rupees. 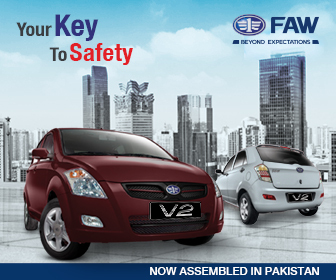 Furthermore since United is yet to open nationwide dealership network, the Bravo is currently available in selected cities of Punjab and the capital Islamabad only. 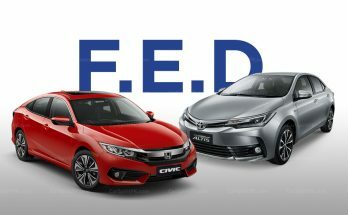 Although many might argue that the Bravo is the best value for money and one must appreciate United Motors for offering so much in this price. 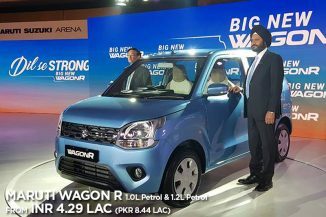 But in reality, this reflects the dismal state of Pakistani automobile market. 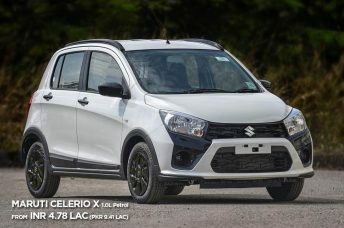 Around the world, this sort of money can buy you a quality hatchback loaded with modern safety and convenience equipment, but one way or the other we still get a decades old product plastered with cosmetics and gadgetry that’s actually a big compromise on quality and safety. Don’t go too far, let’s just take a look at what’s available on the other side of the border, we will find a day n night difference. India’s progress in the auto sector particularly during the last couple of decades is remarkable. 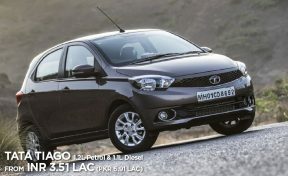 India is currently the fourth biggest automobile market in the world. 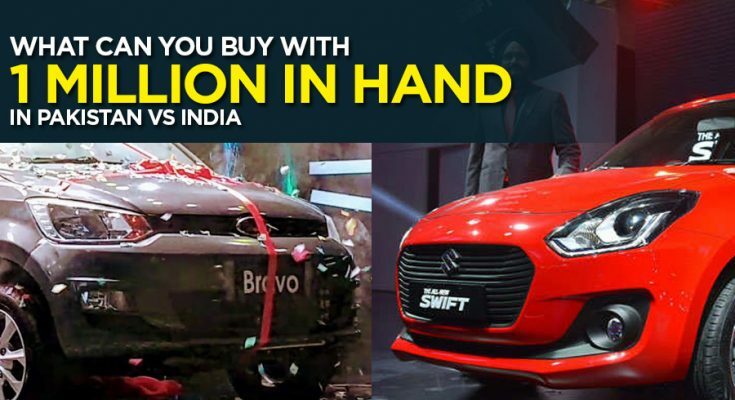 Cars made in India are also exported to several markets across the globe. India is constantly in process of improving and is at the forefront of adapting modern emission and safety standards. It will enforce more stringent safety norms from this year and will be adapting Bharat-VI (Euro6) emission standards from 2020. 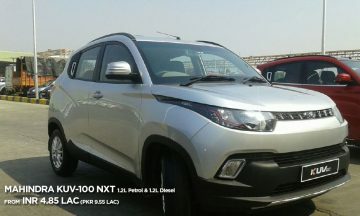 Recently TATA Nexon became the first Indian car to score 5 stars in Euro NCAP crash tests. 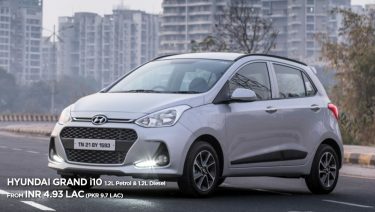 At present there are more than 36 automakers (including domestic and international) currently selling their products in Indian market. This includes luxury brands such as BMW, Audi, VW, Rolls Royce, Bentley, Lexus to performance car makers including Maserati, Lamborghini, Porsche, Aston Martin to economy brands such as Suzuki, Nissan, Toyota, Honda, Skoda, Ford, Fiat etc. 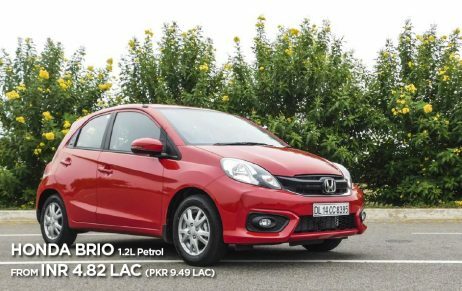 And it’s not just the number of options that they have, the price as well as features on offer portray a stark difference compared to what is sold in Pakistan. 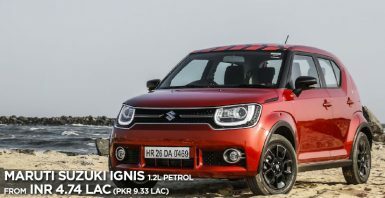 Take Suzuki Swift as an example, while we still have the 15 year old 2nd gen Swift on sale bearing a base price of PKR 15.55 lac, the Swift in India is the latest 4th generation model that has a starting price tag of just INR 4.99 lac. Similarly the Ciaz in India is the well-equipped facelift model with a starting price tag of INR 8.19 lac, whereas in Pakistan we have the old under-equipped feature-ripped pre-facelift model that too with a base price of PKR 20.6 lac. It’s not just the difference of currency as one might think. While 1 INR is equal to 1.95 PKR, lets convert the two into a common currency to better understand the difference. Assuming the price tag of Maruti Ciaz, which is INR 8.19 lac & converts into $11,525 USD. 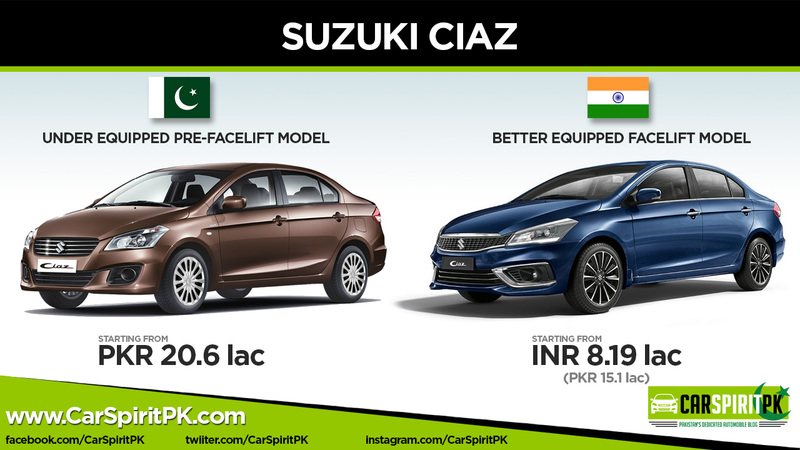 The Pak Suzuki Ciaz comes against a price of PKR 20.6 lac which converts into $14,746 USD. So the under-equipped pre-facelift Ciaz in Pakistan is $3,221 (PKR 4.5 lac) expensive than the better-equipped Ciaz facelift in India. 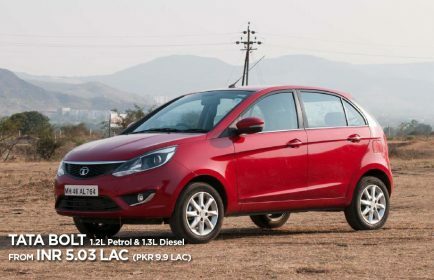 Below is the list of cars that are available in Indian market with a price tag below INR 5 lac (less than PKR 10 lac). If we compare these to the only option we currently have here, which is the United Bravo, one can only wish if someday we might be getting the sort of variety, and more importantly the same quality of products in a reasonable price, that’s available on the other side of the border. Let’s see if new entrants are willing to offer something for the mass market or continue to play safe by launching super-expensive products that only cater to those with strong purchase power.